Quantum Dots Market Size, Share, Analysis, Competitive Strategies and Segments Forecasts, 2018 To 2025. Qamronics India PVT is the joint venture formed by Amtronics and Assam Electronics Development Corporation Ltd, (AMTRON) which is the State-owned Public Sector Undertaking of the Government headed by M.K.Yadava. AMTRON is devoted to advancing emerging electronics technologies that lead to creating new industries and employment opportunities in Assam India, with operations based in Assam Republic of India. a) Within 60 days of execution of this agreement licensee will provide proof of funding in the amount of Twenty million U.S. dollars ($20,000,000.00) for this project. b) Within 120 days of execution of this agreement licensee will provide proof that construction on the facility has commenced. c) Within no later than 120 days of execution of this agreement licensee will place purchase orders and pay deposits on the purchase of the initial lab equipment to include but not be limited to the Schlenk lines, Micro reactors and support equipment. d) Within 210 days of execution of this agreement licensee will provide proof that construction on the facility has been completed. e) Within 300 days of execution of this agreement licensee will provide proof that quantum dot production has commenced at the Assam facility. f) Within 30 months of execution of this agreement licensee will provide proof that solar cell production has been established. The delay in processing of the upfront license fee was largely an unintended consequence of expanding the project scope from the initial $20M to the now proposed $70M. With this payment now in place we are ready to move aggressively forward on this exciting new venture with our license partners Amtronics CC and AMTRON to bring the incredible power of quantum dots and the products they can make better to the India marketplace. Saptember 2018 On the invitation extended to AMTRON by Quantum Materials Corp. San Marcos, Texas, USA for NANO DOT INDIA (ASSAM) PLANNING MEETING, Visited the R & D Lab. & production unit of QMC & had a fruitful meeting with Mr. Stephen Squires , Founder , President & CEO Quantum Materials Corp. and his senior officials today. QMC is going to establish its fourth Nano Dots production unit in the world & first of its kind in India in Tech City Guwahati. May 2018 Board of Directors elected Robert Phillips as its new Chief Financial Officer. May 2018 Company’s board approved engaging RBSM LLP (“RBSM”) as its new registered independent public accountant. Leading American Cadmium-Free Quantum Dot manufacturer Quantum Materials Corp (OTCQB:QTMM) today announced it has completed the regulatory requirements necessary for volume export of the Company’s cadmium-free QDX quantum dots worldwide. Quantum Materials has gained Chemical Abstract Service (CAS) registration for QDX cadmium-free quantum dots through a division of the American Chemical Society and has also completed the requisite analysis in support of the QDX Safety Data Sheet (SDS). Both CAS and the SDS are required in order to ship high volumes of advanced materials abroad. Quantum Materials Corp (OTCBB:QTMM) today announced that the United States Patent and Trademark Office has granted Quantum Materials Corp Patent # 9577149 for the continuous synthesis of high quantum yield InP/ZnS nanocrystals. “This is an important milestone in consolidating and protecting our intellectual property for large scale volume synthesis of non-cadmium quantum dots,” Quantum Materials founder and CEO Stephen Squires stated. “Continuous synthesis micro-reaction technology is the solution for synthesis of high-quality nanoparticles due to the many advantages our patented process provides, including precise temperature control, mixing efficiencies, fast reaction speed and parallel operation for scalable volume production. with several qualified value added film processing groups that we are currently working with. QMA will build two Quantum Dot production line and application development centers in the Beijing and Changde Special Economic Development Zones. The advantages to QMA of siting the facilities in these locations beyond proximity to clients includes a full refund of the land purchase cost upon facility completion as well as a five year state tax exemption. which offers better features, more accuracy, energy savings, less weight, higher reliability and lower cost. Leading American Cadmium-Free Quantum Dot manufacturer Quantum Materials Corp today announced the launching of its new Nano-Materials online store at www.QMCdots.com. August 16, 2017 1000 Hour Quantum Dot LED Milestone Surpassed by Quantum Materials Corp.
Next-Generation QLED's with high performance and reliability now possible. Leading American Cadmium Free Quantum Dot manufacturer Quantum Materials Corp (OTCQB: QTMM) today announced successfully surpassing the 1000 hour continuous on-time durability test for the Company's cadmium-free quantum dots in a remote light emitting diode (LED) application. 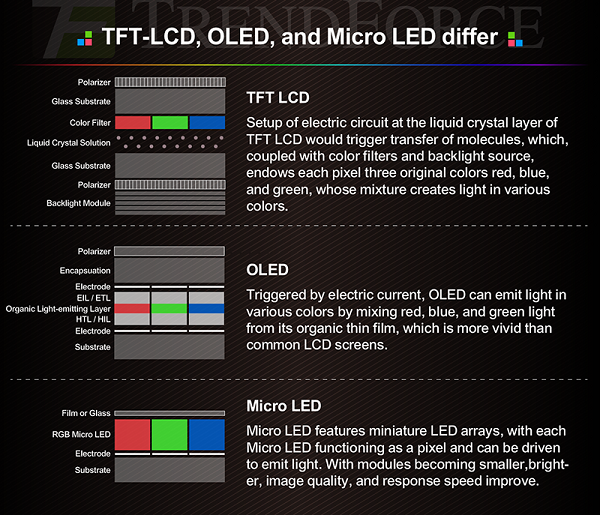 The testing has been conducted with red and green quantum dots encapsulated in resin and mounted to blue emitting LED's (see diagram below), which are similar to the type of LED's used in standard LCD display back light units (BLU). August 10, 2017 Quantum Materials Corp Achieves Record Performance for Pure Red Cadmium-Free Quantum Dots. Advance seen as pivotal step in quantum dot migration to OLED platform and true QD-LED displays. Leading American Quantum Dot manufacturer Quantum Materials Corp (OTCQB: QTMM) today announced that it has achieved near 100% quantum yield efficiency for the Company's pure red (630 nm emission peak) cadmium-free quantum dots. Quantum Materials Corp today announced that the United States Patent and Trademark Office has granted Quantum Materials Corp Patent # 9577149 for the continuous synthesis of high quantum yield InP/ZnS nanocrystals. Freschfield PLC today announced the execution of a funded collaboration agreement by which Quantum will work with Freschfield to integrate Quantum Materials Corp advanced Nanomaterials including quantum dot-based solar photovoltaics into Freschfield's SmartSkinz. Quantum Materials Corp today announced that the Company will be presenting its heavy metal-free quantum dot film by appointment to television, monitor and mobile display manufacturers at the 2017 Consumer Electronics Show in Las Vegas this week. QMC is shipping high performance red and green cadmium-free quantum dot sample sets to display film manufacturers. Separately, the Company recently entered into a $9.75 million common stock purchase agreement with an institutional investor. Whether you invested in QMC years ago or just yesterday, I wish to thank you for supporting the company. It’s been 90 days since I was given the opportunity to lead QMC, and it’s been a hectic period during which the company has made much progress. I have spent time getting to know our team, understanding the technology and evaluating the challenges to bringing our products to market. I’ve spoken with customers and partners as well as many of you and my confidence in the future of our company is greater today than it was when I started. Let me explain why. Over the past year as this development work has ramped up and other projects have come on line, Quantum Materials Corp has tripled its full-time science and engineering staff with the addition of several patent-holding scientists, and engineering and manufacturing operations specialists. In addition, effective September 1, 2016 the Company will double its lab space at Quantum Materials’ San Marcos, Texas headquarters. Display Industry Expert to Drive Technology to Commercialization and NASDAQ Uplisting. Stephen Squires will remain CEO of Quantum Materials Asia and Solterra Renewable Technologies. We are well poised to grow Quantum Materials Corp within the display industry while positioning the company to be a market leader we believe that our continuous flow manufacturing process has us positioned to be an industry leader, as other uses for quantum dots begin to commercialize. Increase shipment quantities as development reaches pre-commercial scale later this year, commercial quantities of a high performance cadmium-free quantum dot film in conjunction with our partners will be available to display manufacturers in early 2017. Increasing concern over the use of cadmium in consumer displays has been driven by RoHS Directives, Our decision to accelerate development of cadmium-free quantum dots and our ability to recruit a distinguished scientific, technical and production team has allowed us to achieve this milestone and initiate ramping-up of sample production volumes.“We value our relationship with Kisco and look forward to working with them at DisplayWeek to continue growing the current customer partnerships they have facilitated and build upon the momentum we are developing as a team,” Mr. Squires will be participating in a CMO panel discussion. Apr-8-2016 Quantum Materials Closes Financing "...we look forward to achieving significant revenues starting later in 2016"
Company has closed its convertible note and warrant financing, previously disclosed in a Current Report on Form 8-K, significant revenue later in 2016. Company is announcing that independent director Daniel Carlson has assumed the role of Chairman. As we look to position Quantum Materials for a potential uplisting to a major exchange, the board felt it was prudent to separate the roles of CEO and Chairman by moving an independent director into the Chair, stated Mr. Carlson. October 2015 Forecast is for Earnings and Revenue this Fiscal Year. Stephen Squires has over 25 years of experience in turnarounds, startups, business development, mergers and acquisitions and strategic planning. Mr. Squires is skilled at identifying emerging technologies and driving commercialization/global market introduction to position companies for growth. From 1977 to1983, he worked at McDonnell Douglas Corporation, a company engaged in the business of building advanced tactical fighter aircraft and space vehicles, developing and adapting advanced materials for combat aircraft applications. From1983 to 2001, Mr. Squires, as founder, served as President and Chief Executive Officer of Aviation Composite Technologies, Inc., a company whose principal business was the engineering, design, manufacture and refurbishment of advanced composite aero structures. Under Mr. Squire's leadership the company grew from zero to over 200 employees and operated a 100,000 square foot state of the art facility. Aviation Composite was merged with USDR Aerospace in 2001. Prior to his employment with the Company which commenced upon the closing date of the Agreement and Plan of Reorganization, Mr. Squire's principal occupation was consulting and advising in the areas of advanced materials, nanotechnology, applications engineering, strategic international marketing with emphasis on middle east and commercialization of emerging technologies for Orasi LLC. Since 1998, Mr. Squires has pursued his interests in advanced materials such as nano fibers and nanotubes where he quickl for service on the Board. Mr. Squires has had experience working for McDonnell Douglas Corporation and Aviation Composite Technologies, each of which brings valuable business experience to the Board. QMC Exhibitor & Invited Speaker Molecular Medicine Tri-Conference, Moscone Center, San Francisco, February 11-13 2013. Mr Squires Topic, TQD's Applications in Emerging Nano Molecular Medicine & Diagnostics, Ranging from Imaging Assays, Multiplex Drug Delivery & Cellular Targeting Platforms. Quantum Dots are the future of molecular medicine and biotech, in assays, diagnostics, theranostics, drug delivery and point-of-care devices. "Green" quantum dot synthesis approach using continuous flow chemistry mass production can dramatically lower the cost of energy transfer conjugates, while delivering better features, and more accurate results and outcomes. These quantum dots are Tetrapod shape, uniform, low cost and mass producible. Biomedical Research assays using tetrapod quantum dots instead of chromophores and florophores have advantages of brightness, stability and reacton time for more accurate treatments & diagnosis. Quantum dots coupled with biomarkers, allow diagnosis of disease which can become point of care care devies in doctor's offices with instant readouts. Bio-compatable Tetrapod QD used in a multiplexing drug delivery platform is also being explored for diagnosis, treatment and eradication of cancer cells. For many biotech applications the ultimate "enabling technology' will be easily synthesized and scaled high quantum dot yield and uniform quantum dots. Quantum Materials Corporation is developing specialized quantum dots for a private biotech company, Nanoaxis LLC to functionalize with their proprietary biomedical nanomaterials for a multiplexing drug delivery platform for drug/gene therapy and diagnostic medical devices technologies. Quantum Materials' CEO Stephen Squires will report on this joint alliance and our progress developing new quantum dots at the CHI Emerging Diagnostics partnership Forum in San Francisco on February 11th. Quantum Materials Corp today announced that the company has executed a funded product development agreement with a leading global optical film manufacturer. Quantum Materials Corp today announced a joint development agreement (JDA) with one of the world's leading manufacturers of display panels. Company expands into new lab space, ramps up second patented continuous-flow production line, reaches QDX™ heat resistance to 260 degrees Celsius and ships QDX™ trial orders to six of the leading global display and television manufacturers. Quantum Materials Corp today released their QDX ™ class of rugged Cadmium-free quantum dots with the highest heat, oxidation and moisture resistance available industry-wide. QDX™ Quantum Dots do not degrade under the high heats used in application to film, silicon and polymer and allow for creative LCD display and LED lighting engineering as well as lowering protective barrier film costs. May 20 2015 Quantum Materials to Announce New Class of High-Reliability Quantum Dots at SID Display Week 2015. Leading North American quantum dot manufacturer Quantum Materials Corp today announced plans to introduce a new class of high-reliability Cadmium-free quantum dots at the Society of Information Display (SID) Display Week 2015 International Symposium in San Jose June 1st. April 29, 2015 Quantum Materials picks up funding to improve flat-screen technology. Quantum Materials Corp. reported raising $490,000 of a planned $2 million financing. The San Marcos company collected the capital from five investors, according to a Tuesday filing with the U.S. Securities and Exchange Commission. "Mr. Lindberg's appointment is effective Monday, April 6, 2015 and is in line with the company's drive to enhance the breadth and depth of its financial and operational leadership team." "Company Announces Availability of 'Strong Shift' Quantum Dots in Commercial Quantities Through Patented Continuous Flow Synthesis Process"
"Company accelerates development to meet display manufacturer demand as a result of management meetings at 2015 Consumer Electronics Show"
Eleven of the twenty-four potential clients have already had one or more face-to-face meetings with company management & 2 dozen automated production samples to potential clients. As a result of our automated production system, we have increased our rate of shipping samples to potential customers and we have delivered more than two dozen shipments. To our knowledge this represents the first shipments of automated production, not manual “batch” production. Our volume production process assures our clients that we can deliver high volumes of quantum dots for industrial use. Industries or uses intended include – Displays, Lighting, Biotech, Anti-counterfeiting, Sensors, Solar, Paint, and Coatings. For the most part, our shipments of samples are to client’s specifications, and for others, these samples are preliminary shipments for evaluation for secondary purposes as we collaborate toward the development of their specific quantum dot enabled product. Today we have a very active pipeline of potential clients that grows daily. These potential clients require a broad range of nanomaterials from relatively simple Red emitting quantum dots to both near and far Infrared emitting Quantum Dots, Thick-Shell Quantum Dots and/or Non-Heavy Metal Quantum Dots. Industries or uses intended include – Solid-State Lighting, Hydrogen Conversion, Displays, Solar, Automotive Glass and BIPV films, Batteries, Lasers, Biotech and Inks. Eleven of the twenty-four potential clients have already had one or more face-to-face meetings with company management. To maintain control of quantum dot production and quality, the Company’s preferred business relationship is a joint venture that evolves from a collaborative development effort where the parties agree to cooperate in the design and production of a range of new end products utilizing the Company’s Nanomaterials and/or screen printing processes, with the other party contributing industry expertise and substantial marketing, distribution and sales capabilities. In most cases, the Company envisions that the industry joint venture party would provide the financial resources to underwrite the project. In some cases, the joint venture may need to seek outside financing for the commercialization phase of the project. In either case, the Company would continue to control the production of the nanomaterials for incorporation into the end products. Alternatively, the Company may choose to license a manufacturer of end products to incorporate the Company’s Nanomaterials into one or more specific products on an exclusive or non-exclusive basis. In some cases, it may be appropriate to dedicate an equipment unit to a single product line (for example, silicon nanocrystals for energy storage) for a single licensee, whether sited at the Company’s facilities or at the facilities of the licensee. In all cases, the license would contain provisions restricting the use of the Company’s technology and protecting its intellectual property. In advancing these development activities, the Company follows a disciplined process to protect its intellectual property and foster collaborative arrangements. First, NDAs are entered into, followed by sample agreements. The Company then formulates, manufactures and supplies product samples to the counterparty’s specifications for evaluation and testing. If successful, this then leads to discussions on the form of a possible commercial relationship. Each step takes time, and the Company is increasing its sample production capacity to satisfy the backlog of requests for its materials of different compositions. Sample production is currently accommodated through use of the lab facilities at the Company’s Wet Lab described below. In seeking to expand its customer base, the Company’s marketing strategy will be to engage in joint ventures or other strategic arrangements with manufacturers and others to jointly develop applications using its patented continuous production process and licensed screen printing technology to maximum effect. Such joint collaborations will involve the Company working closely with the industry counterpart to optimize the performance of the Company’s materials in each application or device, and to use the results from product development and testing to further enhance product specifications to meet the requirements of the market. These collaborations will support the Company’s internal research and development activities, which will continue to be a primary part of the Company’s business. The principal revenue streams for the Company are expected to be from (i) sales of Nanomaterials, (ii) royalties from sales of products and components by third parties incorporating the Company’s Nanomaterials, (iii) milestone payments under joint development arrangements with product developers and manufacturers, and (iv) sub-licensing fees where the Company engages in sub-licensing arrangements for its technology. The Company is preparing to enter the next phase of its development - production and supply of commercial scale volumes of Tetrapod Quantum Dots to potential customers and joint ventures in order to develop a platform of initial customers in various industries. In order to finance the development of its business, including the establishment of its continuous process manufacturing facility, purchase of the first two equipment units and the expansion of its marketing and sales capabilities, the Company will be seeking additional investment capital. Provided this capital raised is successful and can be accomplished in the first quarter of 2014, the Company expects to commerce generating limited revenues from the production of TQD's at the Wet Lab in the second quarter of 2014. Such revenues are expected to be modest at first and will dependent upon generating purchase orders from potential currently under NDA and evaluating the Company's technology. As part of this strategy, the Company has engaged in discussions with numerous target customers and has signed a number of NDA's and Sample Agreements to increase the probability of receiving firm orders from one or more of these entities. The primary short term objective of the Company is to establish its first continuous manufacturing process at the Wet Lab and produce volumes to Tetrapod Quantum Dots for supply to customers on a commercial scale. The Company has completed a joint development effort with a non-affiliated third party provider of industrial process equipment which resulted in the design and successful proof of concept testing of a scalable production unit for manufacturing the Company's proprietary TQD's on a low cost, continuous basis. The Company has negotiated an agreement with the equipment provider for the delivery of a lab scale equipment capable of producing 2 grams per hour. This first unit will be used to validate synthesis protocols for customized TQD's developed to meet customer specification and will also be used to produce samples and to fulfill small to medium-size orders. The Company has also negotiated an agreement with the equipment provider for the delivery of a production scale equipment unit capable of producing 2 kilograms per hour. This unit is intended to be used to fulfill additional commercial orders. Subject to the Company obtaining financing for both of these equipment acquisitions, the sample size and production size equipment units are expected to be delivered to the Wet Lab during the first and third quarters of 2014, respectively. Each unit will be commissioned and tested upon delivery, with a view towards commencing initial production runs of TQD's within 30-60 days after installation. While the Company plans to work extensively with this provider of equipment units, the Company owns all rights to the designs and intellectual property resulting from the development project, and could contract with one or more other competent suppliers of equipment if that became necessary. Quantum Materials Corp to Quadruple Lab Space and Add Scientists Quantum Materials Corp (OTCQB:QTMM) today announced it has signed an agreement with STAR Park that will quadruple the Company's Quantum Dot production space when the new state-of-the-art lab and offices are completed on or before June 2015. The Company is also recruiting to double its scientific staff effective January 2015. Quantum Materials Scaling Up Photoactive Quantum Dot Production for Solar Power Generation Today announced that it is scaling volume production of photoactive quantum dots for use in next-generation photovoltaic solar power technologies. While offering numerous advantages for solar power generation, the high cost and difficulty of producing large quantities of quantum dots with which to develop thin film solar cells has until now kept them from commercial utilization and acceptance. The company is also seeking partners for pilot thin-film quantum dot solar cell factories with Quantum Materials' automated quantum dot production system supplying the material necessary to support daily runs of continuous roll-to-roll thin film production. Quantum Materials Acquires Bayer Technology Services Quantum Dot Manufacturing and Quantum Dot Solar Cell Patents Bayer Patent Families Expand Quantum Materials' Advanced Material Offerings, Reinforce Intellectual Property Protection of Automated Quantum Dot Manufacturing Processes and Enhance Quantum Dot Solar Cell IP to Drive Future Development, Partnerships and Revenue. Quantum Materials Achieves 95% Quantum Yield by Automated Quantum Dot Production Advanced Production Line Provides High Performance, Uniformity and Mass-Production Economies of Scale with Major Implications for Display, Solar and Solid-State Lighting Industries QMC is planning additional capacity on the order of multi-kilograms per day to meet project needs that are being defined. QMC previously stated that capacity could be expanded sufficient to support the entire display industry converted to quantum dot 4K and 8K displays. According to market researcher IHS, demand for QD-LCD displays is projected to jump to 87.3 million units by 2020 (a CAGR of 109% between 2013 and 2020) as QD prices decrease and a reliable and uniform quantum dot supply is assured for large production runs. QMC is positioned to capture QD-LCD market share. Quantum Materials Announces New Outside Directors and Adds Scientific Advisory Board. Quantum Materials Corporation announced today the addition of Mr. Ray Martin and Mr. John Heaton to the Board of Directors. QMC also announced formation of a Scientific Advisory Board chaired by Dr. Ghassan Jabbour, QMC Chief Science Officer and Board of Directors Member, along with Scientific Advisory Board members Dr. Michael Wong of Rice University and Mr. Tomio Gotoh, a pioneer of the Personal Computer in Japan. Mr. Ray Martin is currently CEO of Advanced Lighting Technologies, Fremont, Ca., maker of high efficiency LED drivers and Co-Chairman of Sustainable Silicon Valley, a non-profit with a vision for a sustainable future. Mr. John Heaton spent 29 years in the semiconductor equipment industry, with 10 years as CEO of NASDAQ traded Nanometrics. He is currently Executive Vice President at Advenira, a nanocomposites coatings and deposition technology company. Quantum Materials Secures Uncloneable Anti-Counterfeiting 3D Printing Technology. Quantum Materials Corporation announces securing 3D printing and additive manufacturing anti-counterfeiting quantum dot detection technology developed at the Institute for Critical Technology and Applied Science and the Design, Research, and Education for Additive Manufacturing Systems (DREAMS) Laboratory at Virginia Tech. The technology inserts quantum dots within objects being 3D printed to produce a unique, physically uncloneable signature known only to the object's manufacturer. This new quantum dot security method will help to ensure positive identity of any particular object through a wide variety of application and detection methods. Novel uses inserted of nanomaterials cover a wide field of growing industries of encryption, secure key exchange, the protection of hardware from tampering and other secure identification needs. Quantum Materials Ships 20 Grams of Quantum Dots to Major Asia-Based Global Company in First Weeks of Operation of Scaled Production. Quantum Materials Corp today announced the shipment of 20 grams of quantum dots to a major Asia-based global company. Quantum Materials accomplished the manufacture in a portion of the first week after installation and commissioning runs of the Company's new automated production system. We plan to quadruple production output by January 15, 2015, and have engineered plans in place to deploy short-lead-time parallel systems to meet ever increasing market demand. Quantum Materials Corp. Initiates Quantum Dot Mass Production Months Ahead of Schedule. Quantum Materials Corp announced today that it has received its increased capacity equipment and is launching mass production of advanced materials several months ahead of schedule. As an emerging provider of quantum dots, nanoparticle materials and related platform technologies, Quantum Materials Corp.'s (QMC) production phase equipment is capable of producing 250 kilograms of quantum dots per annum. Quantum Materials Secures Los Alamos Thick-Shell Quantum Dot Technology to Increase Brightness and Stability in Consumer Electronics. Los Alamos National Laboratory (LANL) today announced Quantum Materials optioning Thick-Shell 'Giant' Quantum Dot patented technology with the potental of 10 to 100-fold improvement in solid-state brightness over conventional nanocrystal Quantum Dots (QD). High brightness leads to efficient use of materials and increased performance in electronic displays and solid state (LED) lighting. Quantum Materials Secures Funding to Initiate Expanded Tetrapod Quantum Dot Production. Quantum Materials also reporting that the (LANL) Thick-Shell technology will be integrated with a variety of Quantum Materials composite Tetrapod Quantum Dots to develop a line of high performance quantum dots. Quantum Materials is proud to announce they have teamed with LANL and have jointly written and submitted a proposal for funding to the recent DOE EERE Funding opportunity for Solid State Advanced Technology R&D, which aim to increase performance and market readiness of efficient LED lights incorporating improved quantum dots. Quantum Materials Update on Scaled Quantum Dot Production. Quantum Materials has closed funding necessary to acquire and deploy automated equipment for significantly increased Tetrapod Quantum Dot production. This production capacity has been designed to provide a reliable means of scaling quantum dot manufacturing under conditions that tightly control synthesis parameters that are necessary for high quality materials. Forecasts for quantum dots across several industries have increasingly described a market under rapid expansion. We anticipate that notable customer product launches incorporating Quantum Dot technologies will capture the attention of the public as we move into 2015 and beyond. Quantum Materials plans that the next larger system, expected to be deployed in a similarly expedited schedule, will place the company far ahead of the competition in the ability to supply reliable industrial quantities of quantum dots.